Agriculture can be a taxing industry to work in, and chronic stress is hard on health. UMASH has focused efforts on stress and mental health in farming communities by fostering partnerships and innovation, and by highlighting work happening in agricultural communities. This spotlight features frequent UMASH collaborator Emily Wilmes. 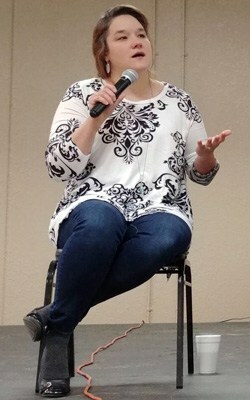 Emily is a Livestock Extension Educator for University of Minnesota Extension in Stearns, Benton, and Morrison Counties. She works directly with farmers and has taken a lead on talking about stress in farm country though collaborations and workshops like this. Farm stress. Mental well-being. Building resilience. Those can be tough subjects to discuss; we don’t always know what to say about them, or how to bring them up in a respectful, constructive way. However, even having those conversations is a step in the right direction. It’s no secret that things out there can be tough for farmers right now, and ignoring the issues only makes them worse. Talking about the uncomfortable stuff – like mental health – helps make it more comfortable. In the past few months, I have had an increasing number of farmers and ag professionals reach out to me on the topic of stress and mental health. Recent cases of farmer suicide have weighed heavy on the agricultural community and I remember there was one conversation in particular with a distraught dairy farmer that really prompted me to do something. I wanted to help educate people, equip them with knowledge about stress and mental well-being, and help break down the stigma that surrounds mental health. 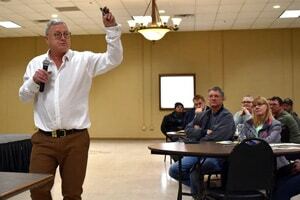 That was the purpose of the “Farming in Tough Times” Extension program I hosted in Sauk Centre on December 7. Over 80 producers, agricultural professionals, and community members attended the meeting that was focused on farm stress, mental well-being, and building resilience. Our ability to bounce forward and thrive through change and challenge. I started the day by talking about positive psychology, which is the study of the strengths and virtues that enable individuals and communities to thrive. 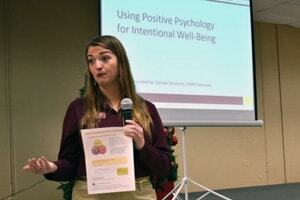 Positive psychology focuses on intentional well-being and leading a meaningful and fulfilling life. Using the concepts of positive psychology, we are able to help build resilience, another major topic of the December 7 event. Dennis Hoiberg with Lessons Learnt Consulting presented on “Resilience in the Face of Change.” Resilience was defined as our ability to bounce forward and thrive through change and challenge. Dennis emphasized that poor mental well-being and physical health can negatively impact our ability to maintain resilience. We need to make a choice at well-being: accept our emotions and feelings in order to grow emotionally and build resilience, or underplay what has happened, which could lead to poor emotional well-being and even depression. Even the most resilient people can, at times, succumb to circumstances outside of their control. 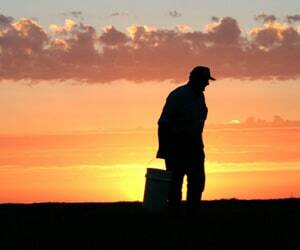 The number of factors farmers face every day is staggering, and sometimes it can be too much. Farming in Tough Times wanted to discuss these issues head-on, starting with a conversation about recognizing stress. There was also discussion about how to express your concern for someone you are worried about. I’ve been worried about you. Can we talk about what you are experiencing? If not, who are you comfortable talking to? Our mental health and well-being can be uncomfortable to discuss, but by sharing honestly and openly about it and our concerns, we are able to foster comfortable conversations. Reaching out to someone can be difficult, but it could be the first step towards recovery and finding help. The meeting on December 7 concluded with a powerful producer panel. Mark Koehn, Brenda Miller, Meg Moynihan, and Brenda Rudolph shared stories of loss, fear, and failure. Their stories also included faith, hope, love, and recovery. The overarching theme of the panel, and the day as a whole, was that it’s okay to not be okay. It’s okay to have a bad day, to feel anxious, to be depressed. What’s not okay is to get stuck in that cycle and allow yourself to become consumed by hopelessness. The panelists were asked what one piece of advice they would share with someone going through a similar situation. All four responded with the same answer: talk to someone. Tell someone you trust how you’re feeling. You don’t need to go through this alone. There are so many people in our lives that care about us and are more than willing to listen to us. You can also visit minnesotafarmstress.com for more information. Emily Wilmes is a Livestock Extension Educator for University of Minnesota Extension in Stearns, Benton, and Morrison Counties. She works directly with farmers and has taken a lead on talking about stress in farm country though collaborations and workshops like this. She is a frequent UMASH collaborator. Stress, depression, and suicide are on the mind of agricultural communities, where economic, social, and environmental forces challenge the health and safety of farmers, agricultural workers and their families. In response to a growing concern about the lack of resources and support in the region and the higher rates of suicide in rural and agricultural communities, UMASH has been working to build partnerships to stimulate innovation and action.